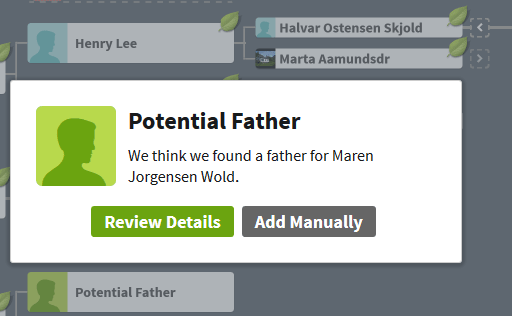 Have you seen those boxes with green silhouette images in your tree titled Potential Father and Potential Mother? This feature has recently been greatly improved. 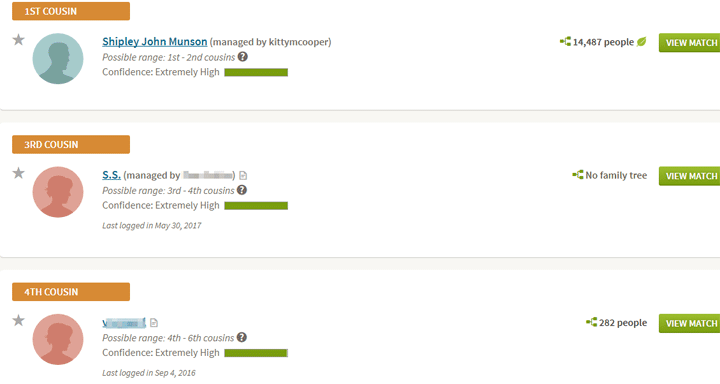 When you click on one of these boxes, Ancestry tells you that it has perhaps found that parent, like the image to the right, and it offers you two buttons, one to review the details and another to add this person manually. Clicking Add Manually just pops up a box with empty slots for you to add that person. 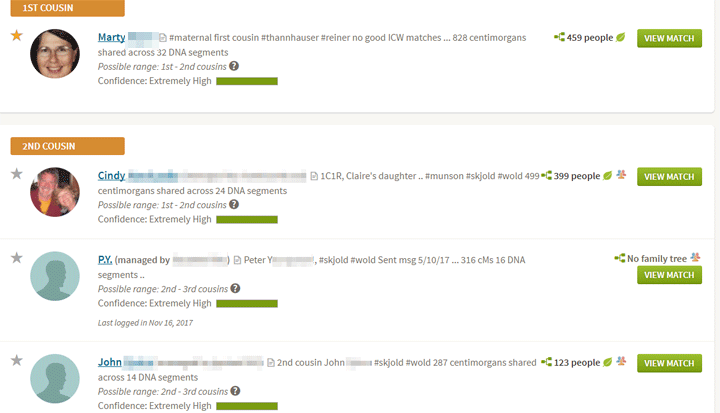 Review Details used to only show you the family information for the person that Ancestry had found, but not where it was from. Sometimes, if it looked accurate, I would click the “Yes” green button to add it for a quick and dirty (Q&D) tree I was making to search for an adoptee’s family. Sometimes it was easy to reject when the family information did not match. However mainly I would go to the hints for that person from their profile in my tree to see if I could figure out the possible parent from there. All in all, the Potential Parent box was only a little bit useful. So how have they improved this? I have shown a number of fellow genealogists the We’re Related app from Ancestry on my smartphone because it is so much fun. Let’s face it, we all like being related to famous people. 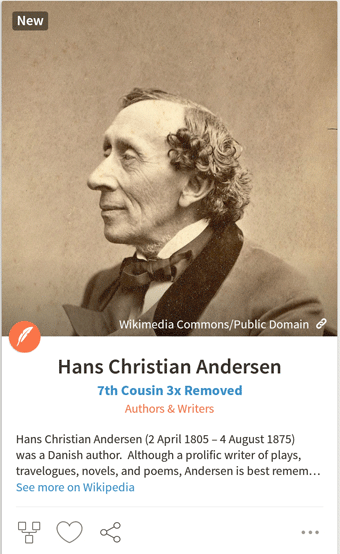 My latest “famous” match is my 7th cousin thrice removed, Hans Christian Andersen, which delights the writer in my soul. This app has also figured out how I am related to a number of my Facebook friends. Of course, they are usually cousins I that found myself with genealogy or DNA and then friended. I must have connected this app to my FaceBook account when I first installed it and of course I connected it to my Ancestry account as well. An exciting recent surprise was that We’re Related found my relationship to fellow genetic genealogist Kelly Wheaton, famed for her free online beginning genetic genealogy course. We had long wondered about a smallish DNA segment that we share on chromosome 16, which is also shared with other relatives, so expected to be real. We had assigned it to a location – Seljord, Telemark, Norway but had not figured out the ancestor. In the app, each cousin match has several icons below it (two on my phone, three on my tablet). The one with two boxes then another below them represents a family tree. Click on that icon or the person’s photo to learn more about the relationship. Although you most often share an ancestral couple, it only shows you one of them, usually the man for most of mine. With over 4 million DNA tests [as of 11 aug 2018 – 10 million], the Ancestry database has reached a tipping point where any tester with American ancestry will get some good cousin matches. How do these help prove an ancestral line? Well when your DNA matches multiple people descended from the same ancestral line, you can have some confidence in that part of your tree. Conversely, if you have no matches on a line, there may be a problem. On your DNA home page, the center panel summarizes your match count. It shows the number of predicted 4th cousins or closer as well as the number of starred and green leaf ancestors. You can add stars to matches for whatever reason you wish. Only you and anyone you share your DNA results with can see them. Ancestry will indicate each DNA match that also has a tree match with you by using a green leaf. Notice the big difference in the number of cousins between those with 19th and 20th century immigrant ancestors like my family and those with deep American ancestry. Also foreigners like my Norwegian cousin will have very few, while Jewish testers will have incredibly high numbers due to endogamy. Click on the green View All DNA Matches button to get to your DNA matches page. 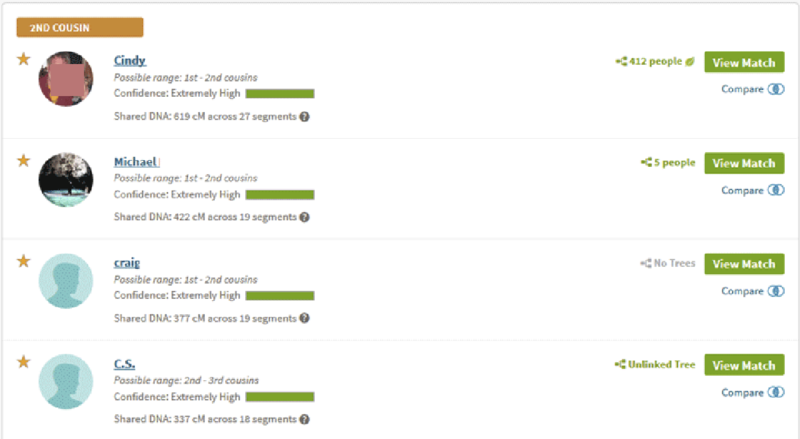 Or click on the starred or green leaf matches to see just those matches. On your match list page, every DNA match who also has a matching ancestor to you in their tree is marked with a green leaf indicating a hint. When there is a green leaf, clicking on the View Match button will take you to a page that will show you a picture of the expected relationship pathway (images of that on page 2 of this article). Many times matches with no tree will actually have a tree that is just not connected to their DNA. You can see that on the view match page. There you can select it in the dropdown menu, as shown below, to get the usual sideways display with a surname list. Sometimes you can even figure out where they fit in from it. 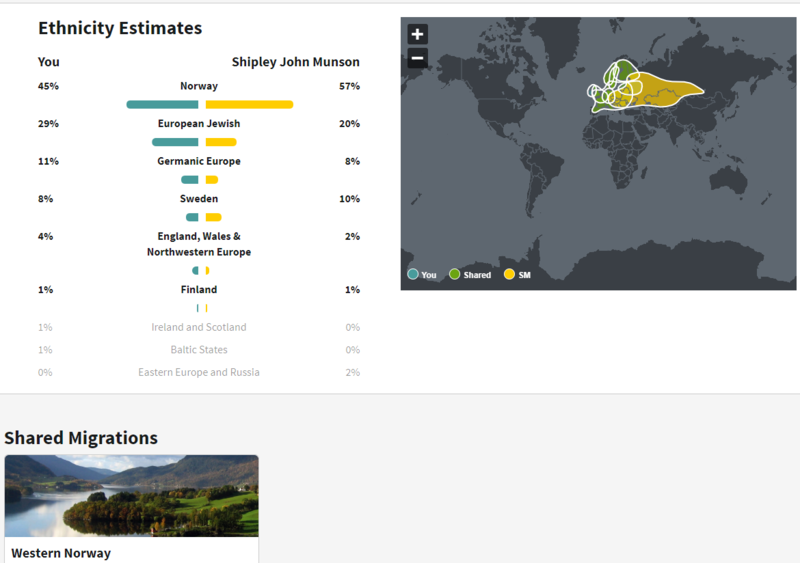 I like to make Ancestry do the work of checking my assumptions by adding the tentative line to the tree connected to the DNA test. I put a “? ?” as the suffix when I am trying out a set of ancestors so that anyone copying my tree is warned that it is a test. Strange characters in the suffix box do not seem to affect the matching. Another perhaps better solution is to make your tree private while you experiment. Or to use a second small private tree that you connect your results to when trying out a possible ancestral line. You can change what tree and who your DNA is connected to on the DNA settings page. Get there from the button with a gear on the top right of your DNA home page. Here are some examples of my experiments.